Leave your worries behind, all ye who enter here. One of my early favorite books was “The Secret Garden” by Frances Hodgson Burnett. Like many a soft-hearted young girl, I was moved by the story of a hidden garden in which a lonely girl and a crippled boy find inspiration and joy. I wanted a garden like that. All through my life I’ve been drawn to such places. While many public gardens put on lavish displays of horticultural artistry, those which retain that “Secret Garden” sense of magical reprieve from the harshness of modern life are rare. The All Hallows Guild of the National Cathedral has nurtured and sustained one such garden in Washington, D.C., for nearly eighty years. The AHG, an all volunteer group which raises funds and helps maintain the Bishop’s Garden, also puts on the wildly popular annual Flower Mart on the Cathedral grounds each May, and offers many education programs including tours of the extensive grounds. Since 1934, one of the Guild’s most beloved projects has been The Herb Cottage, a little slice of old English charm nestled in the shadow of the Cathedral. The cottage actually predates the Cathedral and has a fascinating history of its own. However, the march of time trod rather heavily on the charming old building during the aftermath of the earthquake which shook Washington in the summer of 2011. While the earthquake itself left the cottage untouched, not long after repair work began on the Cathedral’s towers, a giant crane fell on the cottage, damaging the roof and some of the surrounding plantings. Since that time the AHG has been soldiering on, offering The Herb Cottage’s wares in the Cathedral’s underground garage while repairs began on the cottage. But the shake up at the Cathedral seems to have affected more than the architecture. Apparently some in the church leadership viewed the crane accident as an opportunity to “repurpose” (yes, I loathe such words—can you tell?) The Herb Cottage and turn it into a café. Ah. Where do I start? I like cafés. Who doesn’t? Coffee, tea, muffins and whatnot. But is this the best place to locate a social hub? The Herb Cottage is only a few feet from the entrance to the Bishop’s Garden. It’s a landmark and a treasure. And what is more fitting than for it to be used as it always has been, as a place for gardeners and those who love them to buy souvenirs and gifts that celebrate the sublime serenity and grace of gardens in general and the Bishop’s Garden in particular? A café somewhere on the Cathedral grounds is a fine idea. But it needn’t be housed where the clatter of cups and the chatter of customers would inevitably overflow into the sanctuary of the garden air. 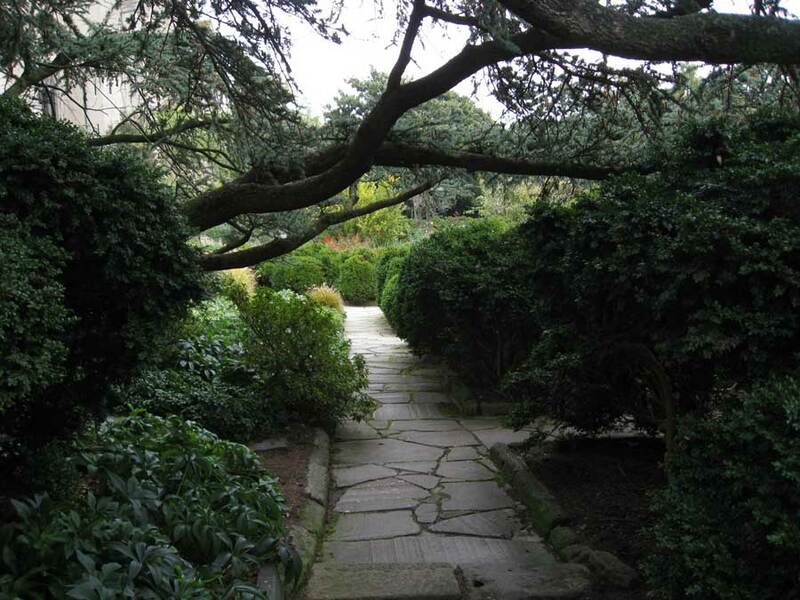 I first stepped into the Bishop’s Garden more than forty years ago. It was a thrilling discovery, happened upon by accident. I’ve returned many times in the years since, though I lived far from the city for much of that time. Now I’m back, and they’re going to replace the Herb Cottage with a coffee shop? I’ve been told that you can’t fight progress. And I’m all for progress. But I’m not convinced that all change is progress. Some things are fine just the way they are, or, in the case of The Herb Cottage, the way it was.